There are several methods by which to ensure that the temperature of refrigerated items inside display cases remains consistent and safe. One of these methods is the installation of woven aluminum night shades on refrigerated display cases and island freezers. These covers represent a far superior alternative to traditional unhygienic display case covers made out of plastic or vinyl. The highly specialized design of ECONOFROST's food safe night blind covers actually repels dust and moisture - preventing the growth of mold and mildew in an unparalleled capacity. 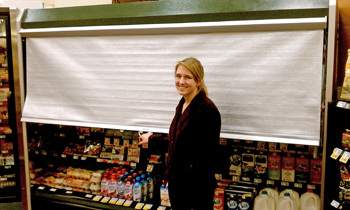 Refrigeration night blinds save energy and effectively keep the radiation of light and heat of the store atmosphere from prematurely spoiling (and thus rendering unsafe and unsaleable) valuable store merchandise. 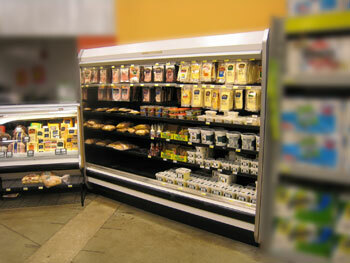 As a result of retrofitting commercial refrigeration cold cases with ECONOFROST, deli meats and cheeses enjoy extended shelf life, dairy products last longer, beverages are kept ice cold and meat products stay fresher maintaining their natural juices for greater shopper satisfaction! 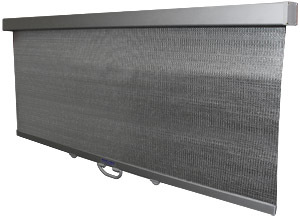 ECONOFROST woven aluminum night covers are a simple, affordable way to save energy and decrease the load on older refrigeration equipment. Simple to install and easy to use, ECONOFROST, the only woven aluminum night cover available on the market, has successfully completed over 300,000 case installations worldwide! ECONOFROST aluminum night covers have been tested by Southern California Edison, who found that customers who use ECONOFROST night covers experience significant savings in energy. ECONOFROST night covers are easy to clean, and easy to use. The patented braking system allows the covers to glide back into place when they are not in use. You can RETROFIT ECONOFROST on any case type and size. If your older equipment doesn�t comply with the new 41� temperature regulation, ECONOFROST can help. By using the covers at night, SC Edison found that it takes up to 15 hours for products to warm back up again. 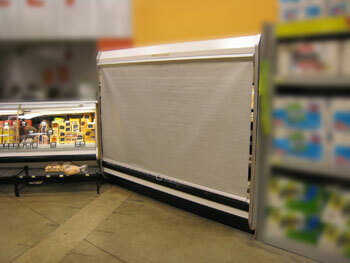 ECONOFROST refrigeration night covers are a trouble-free economical investment for your supermarket or store. Most night cover installations will pay for themselves within 18 months, often as quickly as three months. And many states offer rebate programs for retrofit night covers for both vertical and horizntal applications. Copyright © Market Group Ventures Inc, 2011-2019 All rights reserved.